The Women’s Basketball Hall of Fame announced the Class of 2019 on ESPN2 during the Baylor at Texas game (7:00 p.m. ET). The members of the Class of 2019 are: Beth Bass (Contributor), Joan Cronan (Contributor), Nora Lynn Finch (Contributor), Ticha Penicheiro (International Player), Ruth Riley (Player), Carolyn Bush Roddy (Veteran Player), and Valerie Still (Player). The 2019 Induction will mark the 21st Class of Inductees to be honored by the Women’s Basketball Hall of Fame, which held its grand opening and inaugural induction in 1999. 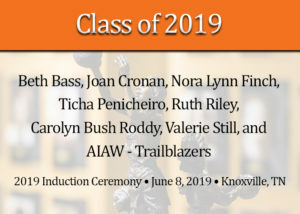 The Class of 2019 will be inducted into the Women’s Basketball Hall of Fame, receiving their coveted Eastman Trophy and Baron Championship Induction Ring, on June 8, 2019, in Knoxville, Tennessee. Tickets for the ceremony are on sale now. Currently Athletic Director Emeritus for the University of Tennessee after serving there as Women’s Athletic Director for nearly 3 decades. The annual AIAW women’s basketball tournament received great publicity, and the 1973 tournament showed that women’s sports could be financially successful with the tournament earning over $4,500 in profits. Some teams played before sellout crowds on campus, and New York’s Madison Square Garden also featured match ups between the top teams of the AIAW era. The Blue Line Trolley provides service to the corner of Hill Avenue next to the WBHOF along with a stop at Volunteer Landing. Hop on the Blue Line to enjoy lunch at Market Square, dinner along the riverfront or a tour of the WBHOF. The Blue Line runs every 7 minutes Monday through Friday and every 15 minutes on Saturday. WBHOF will have shuttle service from the Tennessee Theatre after the Ceremony to the WBHOF for the After Party. There will also be shuttle service from the WBHOF to the Host Hotel following the After Party.